The editor of In Today's Catholic World thanks its loyal readers for their prayers and sacrifices. The *usurpers are infallibly that. No... our Lord and Our Lady have not, and never will abandon us [True Roman Catholics]. (Note: not to be confused with the Roncallian Masonic V2 Imposters and their, still-to-this-day duped "subjects" who have mercilessly desecrated God's sanctuaries for now more than **47 years strong.) The battle is intense, fight and pray, please pray. -The Editor of TCW. *One who wrongfully or illegally seizes and holds the place of another. **Precisely since October 26, 1958 A.D., when Cardinal Siri of Genoa, Italy was elected the lawful Pope of the Church following the death of Pius XII. His Holiness chose the name Pope Gregory XVII, and then was immediately put under vicious, grave duress by treasonous masonic subversives who ruthlessly bullied him aside. 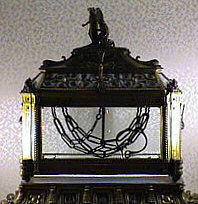 Picture of St. Peter's Chains The first Pope, St. Peter, was shackled with these Holy Chains in the Mamertine Prison in Rome. Petrus quidem servabátur in carcere; orátio autem fiebat sine intermissióne ab Ecclésia ad Deum pro eo. Translation- Peter therefore was kept in prison, but prayer was made without ceasing of the Church unto God for him. (Minneapolis) -Jan 22 - In Today's Catholic World is calling members of the True Faithful, [The Church in Eclipse] to redouble their prayers and sacrifices for the liberty [freedom] and exultation of Holy Mother Church. It is calling those that can see to be more zealous and brave than ever before! Thus fortified with God's supernatural grace, the Church Militant will win the necessary battles that will hasten the cause of the [True] Church to CONQUER the anti-christ anti-popes and their flattering false traditionalist friends. St. John Bosco had many prophetic dreams and visions throughout his holy life. One of his most famous and revealing was the noted Vision of Hell he received in 1868 A.D.
(Minneapolis) -Jan 14 - In Today's Catholic World is posting in its entirety (*see link below), St. John Bosco's horrifying dream/vision of Hell. Many of the dreams of St. John Bosco could more properly be called visions, for God used this means to reveal His will for the Saint and for the boys of the Oratory, as well as the future of the Salesian Congregation. Not only did his dreams lead and direct the Saint, they also gave him wisdom and guidance by which he was able to help and guide others upon their ways. He was just nine years of age when he had his first dream that laid out his life mission. It was this dream that impressed Pope Pius IX so much that he ordered St. John Bosco to write down his dreams for the encouragement of his Congregation and the faithful. Through dreams God allowed him to know the future of each of the boys of his Oratory. Through dreams God let him know the boys' state of their souls. 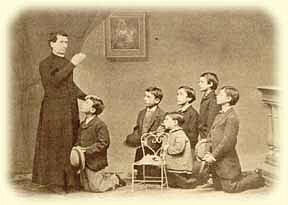 On February 1, 1865 St. John Bosco announced that one of the boys will die soon. He knew the boy through the dream the night before. On March 16, 1865, Anthony Ferraris passed away after receiving the Last Sacraments. 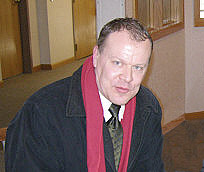 John Bisio, who helped Anthony and his mother during the former's last hour, confirmed the story of his part in this episode by a formal oath, concluding as foIlows: "Don Bosco told us many other dreams concerning Oratory boys' deaths. We believed them to be true prophecies. We still do, because unfailingly they came true. During the seven years I lived at the Oratory, not a boy died without Don Bosco predicting his death. We were also convinced that whoever died there under his care and assistance surely went to heaven." *Note: To read the entire text of St. John Bosco's prophetic Vision of Hell, which gives invaluable insights on how to avoid going there, please click here. Additional note, to view an actual 100% verified Catholic relic in Rome, that shows the black soot markings of the fires of Hell, click here. "The long history and tradition of friendly relations between North Korea and Russia will certainly continue to develop in the future." (Minneapolis) -Jan 8- In Today's Catholic World is posting a very interesting story about an Irish reporter from the news service RTÉ who followed an Irish famine relief group (named *CONCERN) that was working within Communist North Korea. 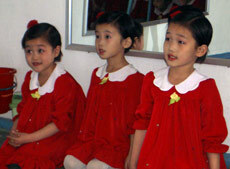 This Irish reporter chronologued an eight day travel diary from November 19-26, 2005 A.D., of her visit to North Korea. Most people are aware that North Korea has bragged about having nuclear warheads pointed at the United States. With the evidence documented in this report, the former heads of the KGB heading the "former" Soviet Union and a "little" country called CHINA; what sane thinker can hold that anti-pope JP2 and his Vatican II vile villains instead of exterminating communism (as the popular myth holds), to the very contrary, by their devilish actions and inaction only and always have strove to bring about their demonic "utopian" dark dream, at any expense. Yet True Catholics have not been duped and are now redoubling their prayers against these reprobate revolutionaries...Strengthened by our valid Masses and with Rosary's in hand, undaunted we fight to hasten the triumphal reign of Our Lady's Immaculate Heart, ever confident that victory will be ours! *TCW has no affiliation with the relief group CONCERN. Background to this news story from the Irish News Service RTÉ: North Korea is one of the most isolated countries on earth. 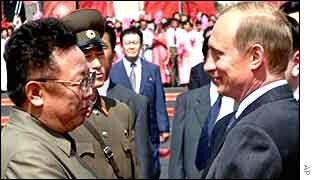 It is led by the reclusive leader Kim Jong-il, who succeeded his father, Kim Il-sung, on his death in 1994. The latter had led the country for nearly half a century. US President George W Bush publically called North Korea part of the 'axis of evil'. The communist country responded by announcing to the world that it had a nuclear device. A famine in the late 1990s forced North Korea to open the door to foreign relief agencies. Now, that door appears to be closing. 'Your flight to Pyongyang is now ready for boarding at Gate 16.' We sipped the last of our cappuccinos in the coffee shop at Beijing Airport and made for the gate, eyeing our fellow passengers, and wondering if one of them was there to watch that we behaved. Or were we just being paranoid? We were welcomed aboard the ageing Ilyushin by white-gloved, immaculately dressed Air Koryo hostesses who served lunch and handed out copies of a week-old Pyongyang Times in English. The lead story was that the Dear Leader, Kim Jong-il, had visited a duck farm and pronounced himself happy with developments. The dateline was Juche 94. Years here are counted from the birthday of the Great Leader, Kim Il-sung, who founded modern North Korea. Instead of the usual weather forecast we were treated to a tourism preview of Pyongyang, and told that during our visit we would see the tower of Juche and the hill where the Great Leader spoke of the revolution. The first group down the steps of the plane was a delegation carrying foil-wrapped bouquets bought in Beijing. They were ready to go straight to the monument to Kim Il-sung to pay their respects. After our baggage was screened we had to hand over a mobile phone and receive a receipt. There's no Vodafone roaming here anyway, but I guess the authorities were worried we might give our phone to someone local who could access either the South Korean or Chinese networks along the borders. Driving into town with CONCERN and their local staff (assigned by the foreign ministry), what I was struck by was the numbers walking everywhere, carrying firewood, furniture or sacks of rice or other food. There was hardly any traffic, just long queues for the few buses on the streets. No ads, no neon, just a long parade of grey and white tower blocks. Pyongyang doesn't do traffic lights - it has traffic ladies instead. At each junction these ladies in blue trouser suits with natty fur collars and hats direct the traffic with batons, with military precision. We are being allowed to stay at a CONCERN apartment in the diplomatic compound. This is considered a big privilege; the few journalists allowed in here are usually confined to a hotel. We head for dinner at the Diplo, a club for diplomats and aid workers where unbelievably awful karaoke music is played to a video which seems to major on alpine scenes. Last night we asked our foreign ministry minder if we could go to Mass, not really expecting that we would be allowed to film. But here I am being escorted into the front pew at Pyongyang's only Catholic church. And Magnus has a bird's eye view of proceedings. The choir is dressed in pink, the pianist in green with pink roses round the cuffs. All the women are wearing mantillas and everyone is singing with gusto. There's nothing resembling a consecration and no communion as there is no resident priest. Magnus thinks he heard the words 'Kim Jong-il', North Korea's current leader, mentioned more than once. No one wants to talk to us or the camera but I slip a hymnal into my bag and make a note to check in with the Columban fathers when we get to Seoul to see how real this church is. One of their number died on the Long March during the Korean War, and many Korean priests were assassinated at that time. Then it's off to see North Korea's monument to its guiding philosophy, Juche, which is often translated as 'self-reliance'. 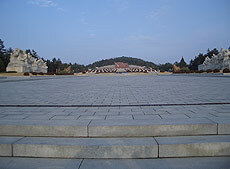 Everything here is built to commemorate someone's birthday - usually Kim Il-sung's. The Juche Tower, which we're told is the tallest stone tower in the world, was built for his 70th birthday. Biggest, tallest, deepest is a recurring theme here - our next monument, the Arch of Triumph, is apparently five metres taller than the one in Paris. From the top there is a terrific view of the city, which rose from the ashes of the Korean War. Our guide says 400,000 bombs were dropped on Pyongyang, more than were dropped on Germany during World War II. 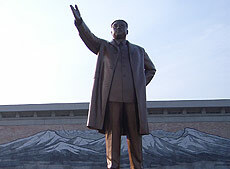 Then it's on to the Great Monument, a rather tacky 20m high bronze statue of Kim Il-sung overlooking the city. Wedding couples are laying wreaths there in a longstanding tradition. This rather surreal first day concludes at sunset at the Revolutionary Martyrs' Cemetery, where bronze busts of various leaders look down on Pyongyang. We're a bit tired of monuments and express a desire to speed things up, citing lack of light for filming, but we get the distinct impressions that our minder is not impressed with our lack of appropriate devotion and reluctance to purchase the obligatory wreaths. On the way back, as we pass through a poor residential area, we see people huddled on the ground. It looks like they are picking herbs or grass. I'm not sure if this is to eat; we can't stop to find out. We are on an itinerary, and any deviation has to be approved. Stopping at will is not an option. We will have to try to get around this. 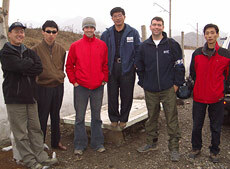 We left for the countryside early in the morning, one of the few TV crews ever allowed outside Pyongyang. What was most noticeable was that every inch of land is under cultivation, and that there is hardly any mechanised transport. Any transport there is seems to be for mixed army and civilian use. Private ownership doesn't exist, so trucks or buses belong to the army or to work units and are crammed full of people. We saw more trucks broken down than fully functioning. Today we even saw the army hitchhiking. It's hard to believe this is one of the world's largest standing armies. But mostly we saw people reduced to pack animals, walking long distances, and bent over with loads of rice, maize or cabbage, or fodder or fuel wood. It's the end of the harvest season and obviously the rush is on to get things in before the winter. There is also the brown sofa phenomenon. I've seen three since we arrived, all being carried on the back of a bicycle, one with a small child perched on top. We saw three people in a bad state today. I saw one man stumble and fall under his heavy load. Another man was being comforted, clearly in distress at the side of the road. And I saw an old lady being loaded into a cart, clearly exhausted. The famine here in the late 1990s killed up to three million people, and malnutrition is still a major problem. Earlier we had visited a tree nursery being supported by CONCERN. As Mike,CONCERN's forester, explained, the famine in the late '90s meant that people started growing food even on mountainous slopes. So trees were cut down. But that meant there was nothing to hold in the land, and landslides and flooding had wreaked havoc. So now the race was on to reforest vast swathes of the country. But CONCERN has to leave at the end of the year, and the government has decided it doesn't need humanitarian assistance anymore. The locals at the nursery seem to have developed a good relationship with Mike. He even managed to persuade the authorities to let him bring some of the nursery managers in the area to a CONCERN workshop in Ethiopia to learn new techniques and share experiences. And they had a treat in store for us. When we arrived we saw two men pouring what seemed to be a flammable liquid over shells on a piece of matting and setting them alight. 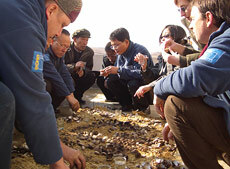 It was a clam barbecue, ready in minutes and served with local firewater. And that was just for starters; a full lunch followed. This was a sign of the hospitality that would greet us everywhere this week. There is a saying in North Korea - 'even if we are eating gruel we will give the guests rice'. They're obviously sorry to say goodbye to Mike and are very grateful for the work done here, but they have to accept the government decision. It could be a long time before they have contact with foreigners again. Today we went up the mountains, up to the snowline for the first time. North Korea is 80% mountainous, which is why producing enough food is always going to be impossible. Once again, everywhere we went there were people dragging home the last of the harvest. We crossed over a beautiful mountain pass to reach the town of Hoichang. Some of the scenery is really stunning. When we arrived the local kindergarten had laid on some entertainment. CONCERN had put in latrines here and had also put in new windows and doors to keep out the cold. The children, all girls dressed in pink, had an hour-long routine ready, but we could only stay a short while. The singing was incredible in itself, perfectly in tune, but the choreography was quite amazing. Everyone was in sync with each other in a robotic kind of way. In fact, it was spooky. And when I asked what the lyrics were, I was told 'the kindergarten is the bosom of mother, the kindergarten is the bosom of the Party'. These were five-year-olds. Then we went to visit a village where CONCERN had helped install running water. The women of the village were thrilled. Up to now they had to walk up the mountain for drinking water and wash their clothes and vegetables in the stream, which they said was icy cold in winter. It's the kimchi season, so they were all busy pickling cabbage to get them through the winter. Back in Pyongyang we manage to get out on our own for a while and get some street scenes on the mini DV camera. Despite several requests we haven't been allowed to visit any of the private markets that are the only outward sign of the market reforms of 2002. We manage to film one street stall. It's hardly going to bring the regime down, but they seem incredibly reluctant to show any evidence of private enterprise. And yet at the same time they are asking us how they can improve trade and learn from the Irish economic model. Today had its bizarre elements but none more so than our visit to a guesthouse where the Great Leader, Kim Il-sung, had once stayed. I was invited to use the room he had stayed in to freshen up. As customary it had a photograph celebrating his visit on the wall. It also had a massive en-suite bathroom - with an electrically heated red plush velvet toilet seat. Earlier we had visited the latrines that CONCERN had built for a series of apartment blocks in the town of Dokchon. Clean water and proper sanitation is one of the best ways of preventing disease such as diarrhoea, which needlessly kills thousands of children here. Dualta O'Ruhin from Kiltimagh in Co Mayo has been working on these projects for 18 months. He's very sorry to be leaving, and notes that because of North Korea's modus operandi he won't be able to stay in touch with the friends he has made here. It was a grim area. Outside people were making lumps of fuel from coal slag and mud. Heating their homes will be really difficult this winter. We travelled on to Pukchang, through one of North Korea's mining areas. Pukchang has one of the country's largest coal power stations and it's very polluted. They can't afford the equipment to bring it up to scratch. On the way we visit a clinic which has been supported by CONCERN. The Irish agency had put in a traditional birthing room and refurbished the small wards, but when we took a look around we couldn't find any patients. The sheets were pristine and looked like they had been put on freshly that morning. When we asked where the patients were we were told that they were all well and had gone home. 'But this is a 24-bed maternity unit,' I said. 'Is it really possible that there are no mothers or babies?' The manager hung his head. Then he insisted that we take a picture of him and all the nurses on the steps. We could hear sounds coming from another part of the clinic; the missing patients presumably. Apparently this is standard practice when foreigners visit North Korean hospitals. Bizarre. I was woken this morning by the usual North Korean alarm clock. At seven o'clock a hooter goes to wake everyone up and shortly afterwards a minivan with loudspeakers drives around playing revolutionary music to encourage everyone to get to work and school. We hit the road straightaway as we had an appointment with the Pyongyang institute of foreign languages. There's a university level course and also a secondary school which specialises in intensive language studies. We met a class of 15-year-olds with excellent English. They were having a lesson about computers and without any difficulty they defined virtual reality, modems, a computer programme and even the World Wide Web. But when I asked what websites they used the room went silent. North Koreans, with rare exceptions, aren't allowed to use the Internet. There is a North Korean only site, but no access to material from outside the country. It's hard to see how the regime can keep the Internet and mobile phones out of bounds forever, but they are doing their best. We barrelled down the Reunification Highway toward the DMZ. [...] In the middle of nowhere orange-bibbed women swept leaves away from the median. There's no such thing as unemployment here. Today was our last day, and a chance to visit Asia's Berlin wall, the Demilitarized Zone (DMZ) that separates North and South Korea. After World War II the Soviet Union and the US divided Korea at the 38th parallel. In the North, Kim Il-sung took power with a communist government; in the South, a US-backed government took control. The Korean War of 1950-53 killed an estimated five million people, but the border barely changed. Since then it's been one of the world's most tense standoffs. 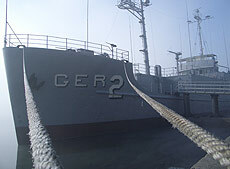 The two sides are still technically at war, though a ceasefire was signed in 1953. There isn't much of a build-up until you see a long row of large rocks. Some kind of anti-tank barrier, I guess. We pass a sign that says Seoul 70 km, but of course there's no way of getting there. 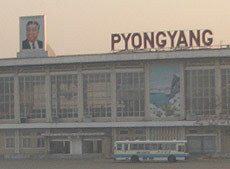 Tomorrow we will have to fly to Beijing from Pyongyang and then take another flight to Seoul. 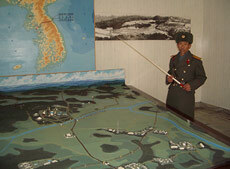 Then we arrive at a modest building and are introduced to a North Korean Lieutenant Colonel. He will be our guide. No opportunity is missed to make it clear to us that the US is to blame for the division of Korea, and that it is the US that has carried out provocative moves over the years. In fact, North Korea has made several attempts to tunnel into the South. We drive down into the zone, a four-kilometre wide strip of land, where no arms except side arms are permitted. At the actual border North Korean soldiers and their South Korean counterparts (with UN flashes on their uniforms) stand just centimetres apart. 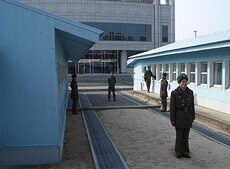 The South Koreans wear US-style uniforms and shades and walk around the place peering at us through their binoculars. 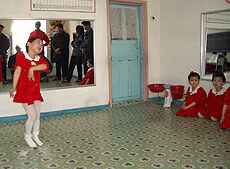 The North Koreans stand rigidly to attention. It's their turn to man the UN hut which straddles the border, and the Lt Colonel takes great delight in telling us that he and we are standing inside South Korea. There's no sense here that the third world war is about to break out. It all feels very contained. And yet the nuclear threat remains real, even if it's the ultimate bargaining chip that has no value once used, as of course the regime would be annihilated in return. We got our phones back and checked in, with the tapes in my handbag just in case anything went wrong. North Korea had been fascinating and frustrating, but also remarkably friendly. It was sometimes hard to remember that behind the brief glimpses we had witnessed, there is also an infrastructure of prison camps and repression that goes unseen. We landed back at Beijing Airport Terminal 2, Gate 16, the same place we departed a week ago. In the meantime, we had learnt that the twice-weekly Air Koryo flight - the main link with the outside world - always operates from this gate. 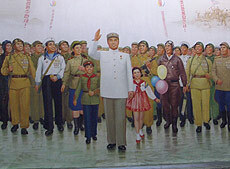 In the leaders and numbers obsessed world of North Korea, 16 February (16/2) is Kim Jong-il's birthday. St. Gemma Galgani "The Virgin of Lucca"
The mother of the family that invited St. Gemma Galgani to live with them after of both of her [St. Gemma's] parents had died, Signora Giustina Giannini, would later say of Gemma:"I am able to declare on oath, that during the three years and eight months that Gemma was with us, I never knew of the least trouble arising in our family on her account, and I never noticed in her the least defect. I repeat, not the smallest trouble, not the smallest defect." (Minneapolis) -Jan 1- In Today's Catholic World is, as most of it's readers know, a part of the Group of True Catholic Websites called StGemma.com Web Productions. 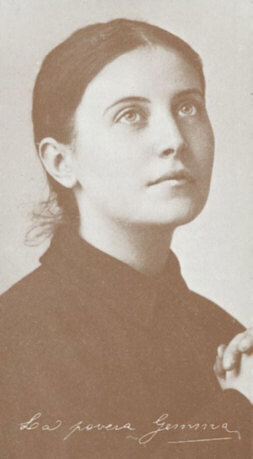 St. Gemma Galgani was a Saint whose only desire was to suffer for her Love - Jesus Christ. St. Gemma although not a nun, had no time for the world and it's false traps and flattery. She loved her Roman Catholic Faith, and kept one goal before her always: To Become a Saint! St. Ignatius of Loyola had counsled in essence, that it is not the number of years one lives that matters but instead how one lives that does. St. Gemma died at the age of 25, but had lived a more full and perfect life than the vast majority of mankind because she fulfilled God's Will as best as she possibly could in every single act (big or small) she did. She, was officially canonized by His Holiness, Pope Pius XII on May 2nd, 1940 A.D. The Virgin of Lucca, as she piously became known as by the faithful, is a very powerful intercessor. In Today's Catholic World in order to help True Catholics get the new (calendar) year off going well, (that is with their "spiritual compasses" pointed North) is presenting two *Triduum prayers dedicated to the holy St. Gemma Galgani, who this True Catholic Apostolate is named in honor of. Note: The first Triduum prayer listed is to obtain a special favor, and the second is to help the sick and the infirm. To view both of these Traditional, Church Approved prayers please click here.